Roman Waterglobe - Wild Geese - Perfect Father's Day gift. 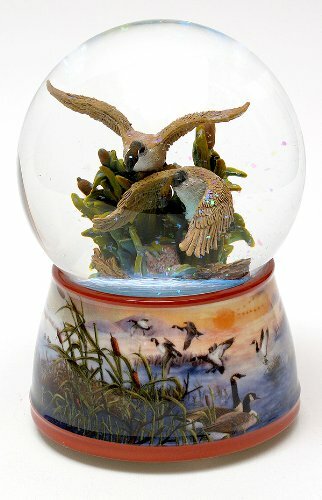 Glass waterglobe with detailed waterfowl scene inside and nature scene painting around porcelain base. Measures 3.75"x 3.75"x 6". If you have any questions about this product by IWGAC, contact us by completing and submitting the form below. If you are looking for a specif part number, please include it with your message. Alexander Taron Importer PR1004 Perzy Decorative Snowglobe with Christmas Tree, 5" x 3" x 3"
Alexander Taron Importer PR1720 Perzy Decorative Snowglobe with Snowman & Shovel, 7" x 3" x 3"
Alexander Taron Importer PR1158 Perzy Decorative Snowglobe with Mini Christmas Tree, 1.5" x 1" x 1"
Alexander Taron Importer PR1290 Perzy Decorative Snowglobe with Small Polar Bear, 2.75" x 1.5" x 1.5"
Alexander Taron Importer PR1722 Perzy Decorative Snowglobe with Large Skiers, 7" x 3" x 3"
Alexander Taron Importer PR1759 Perzy Decorative Snowglobe with Large Christmas Tree, 7" x 4.75" x 4.75"